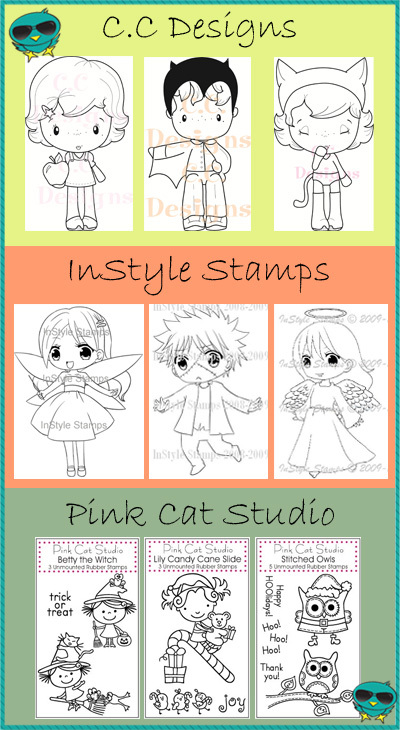 By popular demand, we’re excited to introduce CC Designs, In Style Stamps and Pink Cat Studio to our line of rubber stamps. Come over to meet our newest sweet characters; Lily and Billy from Pink Cat Studios, Ava from In Style Stamps and Swiss Pixies Nora just to name a few. We also have to mention that these characters all have equally adorable entourages! We thought we were getting a head start by stocking up on the upcoming fall and winter season’s holiday stamps, but has anyone noticed the weather cooling up quite a bit? Scary isn’t it? Soon enough we’ll be listening to Christmas jingles in the mall elevators. So stampers, this is our first official reminder to you, it’s never too soon to get started! Also a quick reminder that our 3rd Color Challenge Contest is coming to an end on the Wednesday, September 15th so be sure to get all your entries finished and entered!